The rich mocha brown knotty alder finish of this chest make it a beautiful and luxurious place to store clothes and other belongings. A felt-lined top drawer protects your jewelry and other fragile items, while a cedar-lined bottom drawer with a hidden compartment keeps your clothes safe, fresh and pest free. Pull out valet rods provide a quick place to hang your freshly laundered clothing. Supported by elegant bracket feet and decorated with oil bronzed hardware, this piece will be a stately addition to your bedroom. 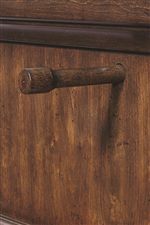 The Bancroft 4 Drawer Chest by Aspenhome from Bullard Furniture. We proudly serve the Fayetteville, NC area. Product availability may vary. Contact us for the most current availability on this product. Eliminate the need to run from your closet to your dresser every morning by putting tomorrow's entire outfit all in one spot with this chest's pullout hanging rod. Use the rod to hang freshly ironed tops or pants, and simply push it back into the chest when not in use for a cleaner appearance. The rod is perfect for displaying scarves, necklaces, or ties, and can also be used to hang your purse or bag, keeping them off the floor and in an easy-to-remember location. 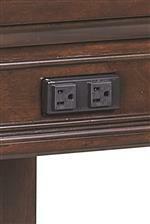 This item features a felt lined top drawer to help you organize and protect your accessories. The felt-lining prevents metal items from scratching the wood, and holds items in place, ensuring delicate pieces like necklaces and bracelets don’t get tangled as you open and close the drawer. Eliminate the need for bulky jewelry boxes and keep your fragile items organized with the thoughtfully included felt-lined top drawer. Perfect for out-of-season clothing or extra bedding, cedar lined bottom drawers resist damage from moisture, mold, and bug infestations. The strong wood provides a smooth, snag-free surface to help protect your clothing, eliminating the need for hazardous products like moth balls or chemical sealants. A testament to fine craftsmanship and quality furniture, cedar lined drawers offer protective storage accompanied by pleasant aromatics that help to create a warm atmosphere in any bedroom. This collection offers a sleek traditional style with hidden futuristic technological benefits such as touch lighting, built-in AC and USB outlets for charging cell phones and other devices, and drop down drawers for storing and using your media. 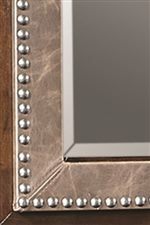 Rustic oil bronzed hardware and classy nail head trim accent the rich mocha brown finish of knotty alder veneer making your bedroom classically warm and inviting. Ceder-lined bottom drawers keep your clothes fresh and bug-free, while felt-lined top drawers keep your jewelry and other prized possessions unscratched. 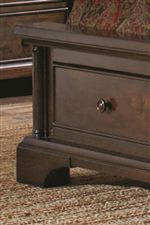 The Bancroft collection is a great option if you are looking for Traditional furniture in the Fayetteville, NC area.